Bjorn’s Gift by Sandy Brehl. Crispin Books, an imprint of Crickhollow Books, Milwaukee, WI, 2016. “Mari knew that writing to her brother could never happen with Germans in control. They read everyone’s mail, listened to phone calls, followed people in the streets, and even locked up some…always looking for information about anyone who might be involved with the resistance.” And Mari’s brother is fighting, somewhere, with the resistance. But when Mari discovers a secret place to call her own, she chooses to write Bjorn regularly, in hopes that one day he will come home and be able to read the letters she cannot send. When her older sister, Lise, comes to visit Lise shows Mari the perfect hiding place for the precious letters, just in case a soldier searches their cottage. In Bjorn’s Gift, the sequel to Odin’s Promise, Sandy Brehl writes a riveting story that kept this reader on the edge of her seat, wondering what would happen next. As Brehl’s research revealed, the people of Norway found simple, yet effective, ways of resisting the Nazi occupation. Many of those techniques are outlined in this novel. When Mari’s father generously offers the soldiers his home for them to stay in—and moves the family to Mari’s grandmother’s small cottage—Mari wonders why her father is being so accommodating to the Nazis. When her family receives extra rations for the favor she is conflicted. But, as Mari will discover, all is not black and white when it comes to resistance. When Lise comes for a Christmas visit, she reveals how her husband has been using the Nazi’s fear of germs against them. When Mari learns that a classmate, Leif, is hanging out with the Ungherd, a Nazi group for boys, she’s shocked. Her disgust with him and his apparent admiration for her, a crush perhaps, lends more intrigue to an already suspenseful story. When he tries to convince her that the Nazis are here to stay and she’d better go along to get along, she rebuffs him. Eventually, not trusting Leif, she learns to hold her tongue in order to keep her family safe. But he becomes a constant thorn in her side throughout the story. 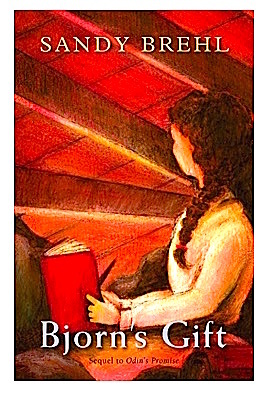 Bjorn’s Gift is a compelling novel told with skill, but even more than that, it illuminated for me a whole host of details about the Nazi occupation of Norway, of which I knew little. The extensive glossary, complete with German and Norwegian translation guides, author’s note, and bibliography will be a useful resource for inquisitive readers and especially teachers who wish to pursue the subject with their students. This is one of the best historical novels for the middle grade that I’ve read. I predict it winning awards. If you’d like to be considered for a Bjorn’s Gift book give-a-way, leave a comment below by September 11. U.S. and Canada only. I am so eager to read this sequel to Odin’s Promise and to attend Brehl’s Oct. 2 book party at the Hales Corner Library! Jerrianne, thanks for the encouragement and for planning to come! I’m looking forward to hearing what you think of it! Sandy has an amazing way of spinning a tale. Can’t wait for this sequel! Tusen takk, Cathy! Hope you enjoy it. Sandy has an amazing way of spinning a tale. Can’t wait to read this sequel! Great Review, Steph! I can’t wait to read it! Hope you enjoy it, Pat. Can’t wait to read this and attend the book party. Thanks for reviewing it, Stephanie! Janet, so grateful for the support! Steph tells me you’re the winner, so I’ll be in touch soon! I’d love to hear what you think of it, Carol.